Engineered by 5.11 Tactical with feedback from the special operations community, this new technology exceeds boundaries in all types of footwear on the market including highend running shoes. Specific components include: carbon based rubber outsole, Phylon mid sole, Hypertex lasting board, nylon flex-fit composite shank, four layer insole system, lunar lining, accompanied with our technical socks. All of these elements are strategically combined to offer you ultimate support for high impact activity. Our Shock Mitigation System® is lightweight with superior compression and rebound resulting in comfort, stability, and optimal SPEED. These socks provide unmatched comfort and performance. With Coolmax® for wicking, nylon and rubber for strength, and spandex for comfort, this sock is an integral part of the Shock Mitigation System®technology. 511 socks have 12 zones of varying compression and fabric blends for increased blood circulation, heat reduction, added stress relief, comfort, and resiliency. 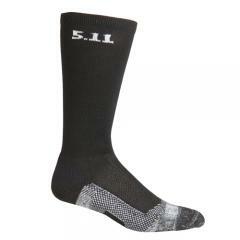 And don't forget to check our our wide selection of tactical boots to compliment your 5.11 apparel.